As mobile apps become more popular, it's tempting to throw up lofty predictions with big billion-dollar figures attached, as Chetan Sharma Consulting does in a new study. 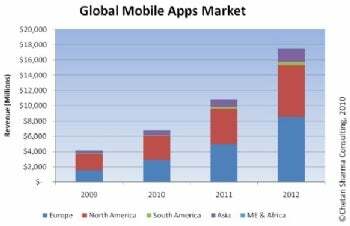 But the study's projection of $17.5 billion in mobile app sales in 2012 seems too good to be true. Red flags went up in my mind upon reading that Getjar, the world's second largest app store, commissioned the study (PDF). I don't think that alone invalidates the conclusion, but it certainly merits a closer look at the methodology. “Today, native provides much richer functionality and access to capability and as such much richer experience than a browser does,” the study says. Fair enough, but we're not talking about today. We're talking about 2012, which is a long time from now considering how quickly mobile technology has evolved. Two years ago, Apple had just thrown open the door to third-party iPhone app development. Much has changed since then, and a lot can change over the next two years. The study disregards the mobile Web's chances over the next two years based on the logic that HTML 5, an emerging standard for multimedia on the Web, won't penetrate the browser market for a long time. But what about Flash? The study doesn't mention it at all, which is odd considering that Flash is coming to Android phones (predicted to be a leading mobile OS by 2012, mind you) and that some competitors to Apple's iPad are touting Flash as a killer app. Don't get me wrong, I love mobile apps, but only while they're better than what you can get through a phone's Web browser, free from the restrictions of whatever app store you're using. Chetan Sharma doesn't think the change will happen in two years. I do. I'll admit, we are both speculating.